The exceptional talent of our silhouette artist is very apparent in this extremely well-cut and detailed silhouette of the cut and paste type. Notice how finely carved the features are. The detailing is done with a gray wash and is meticulously executed. The man is wearing the popular striped vest and many pains have been taken to give the hair a soft realistic appearance, being combed forward in the style of the day, c. 1800-1810. The proportions are excellent and a fine painterly quality is evident throughout . . . silhouettes of this type can have artistic merit comparable to a good painting. It is framed in a gold gesso frame with papier` mache mat. 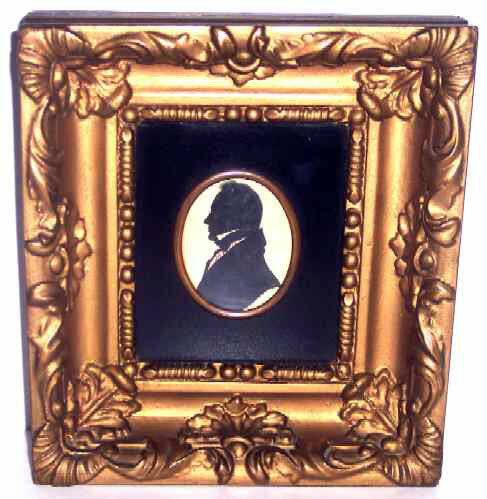 Both the frame and the silhouette are in exceptionally fine condition. Size is 2-1/2" x 3" (sight) and 8-1/4+ x 9-1/4" overall.